I must admit this technique is not high on my "want to do again techniques", but that being said, I'm ok with the results. The background is the 2nd one I did yesterday that I mentioned, using similar colors that Ted (Stampers Anonymous) did on a manilla tag. I used an Impression Obsession CAC "Wavy Lines" stamped on the horizontal. Love this stamp. Clear embossed, then sponged Broken China & Peeled Paint, clear embossed tapping of excess etc, then sponging Vintage Photo. 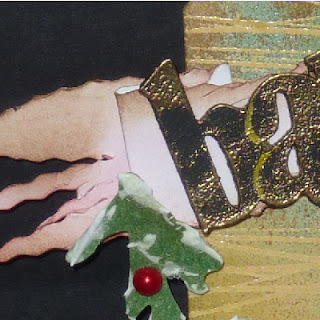 The bauble images are jewelry pieces from an advertising magazine. One was a heart with ruby and diamonds surrounding it. 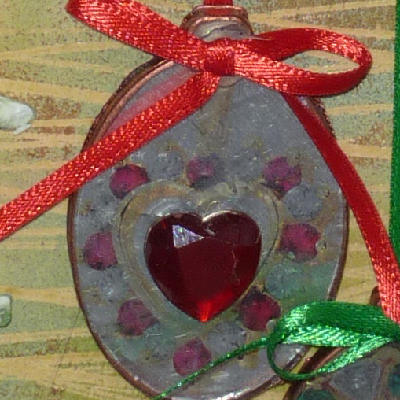 When the bauble was done, I added a large red heart rhinestone. The green one was a large emerald and diamond ring. I used a Krylon Copper leafing pen to color the edge of the baubles, then tied and adhered the bow and hangers. Electronically cut 4 layers of the word Baubles from 110# white cardstock, adhered them together and painted with black acrylic paint. When dry, swiped a stamp pad across the edges and top and embossed with gold embossing powder. I didn't have the banner die, so just cut a piece of cardstock the approx size, tattered the edges, sponged Festive Berries all over lightly, then a bit of Vintage Photo. Adhered the word. 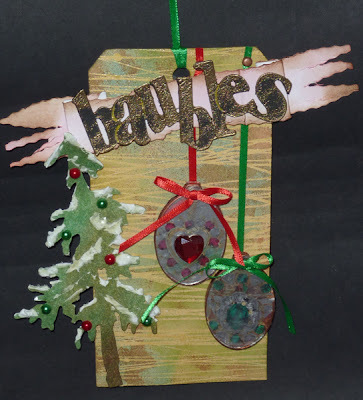 Sponged several greens and some brown on a piece of white cardstock and die cut with Tim's tree die, then applied Aleene's "True Snow" along the edges and sprinkled with Crystal glitter. Assembled everything, the tree and banner with pop dots. Added the green and red half pearls and a green ribbon hanger. Love the background and the fragmens are lovely! Nice innovation and great bling! How pretty and fun too. Love your choice of images and the sentiment is perfect for all of it!